Santorini has a variety of beaches, characterized for their unique wild beauty. 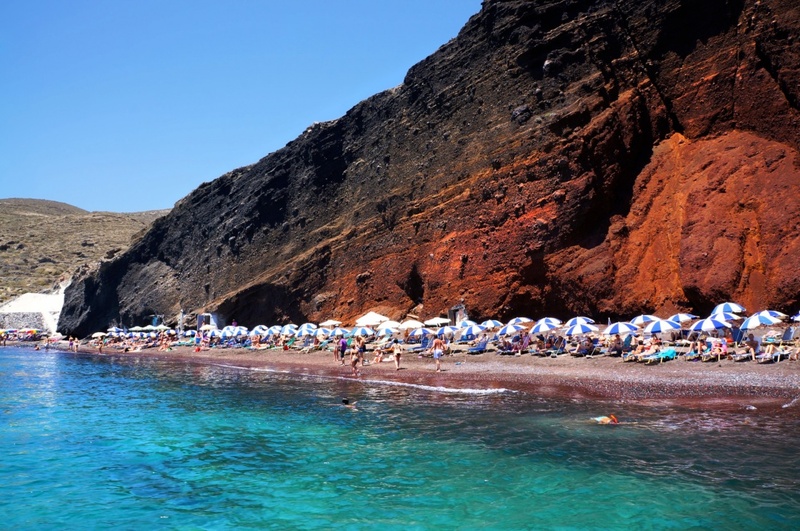 The truth is that in Santorini you will find an amazing variety in scenery regarding the beaches as the deep blue waters, the volcanic rocks and the black sand are elements that you will not find easily in the islands. Most of the island’s beaches are covered in black sand and one thing is certain: in Santorini you will love swimming, as the waters are crystal clear and deep. In the south part of the island, that is the busiest part of the island with a variety of hotels and restaurants and is the most touristic area, you would find Perivolos, a beach with fine sand and clear water and one of the most popular beaches of the island and Perissa, perhaps the most popular one! Its black sand and amazing waters, along with its beach bar has all you can ask for. Agios Georgios and Vlihada with their white rocks, organised beaches with shallow waters are also offering you some of the most amazing choices in the island. 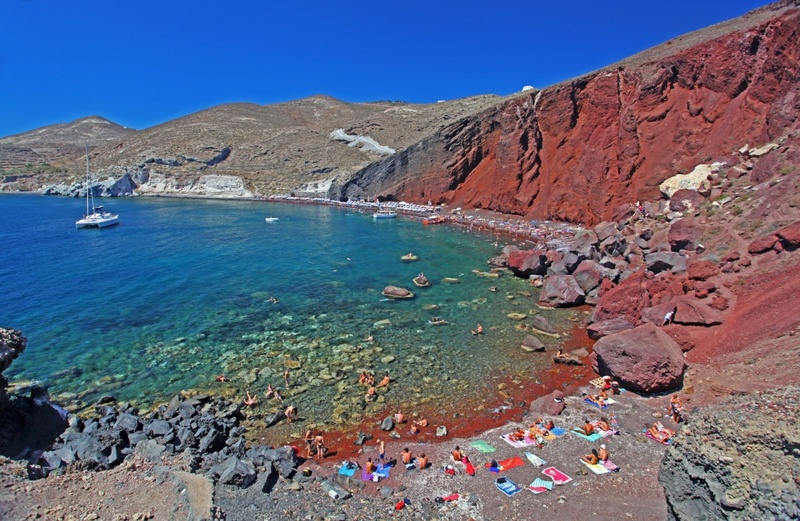 In the south part of the island, you will also find the Red beach, one of the most picturesque beaches of the island near Akrotiri that might be situated in a more quiet area but is as busy as the rest of the beaches thanks to its crystal clear waters. The White beach, which is surrounded by high white cliffs, are also some more of the most interesting beaches of Santorini. In the east part of the island you will also find a wide variety of very amazing beaches like Kamari offering you a great swim in an unforgettable scenery. 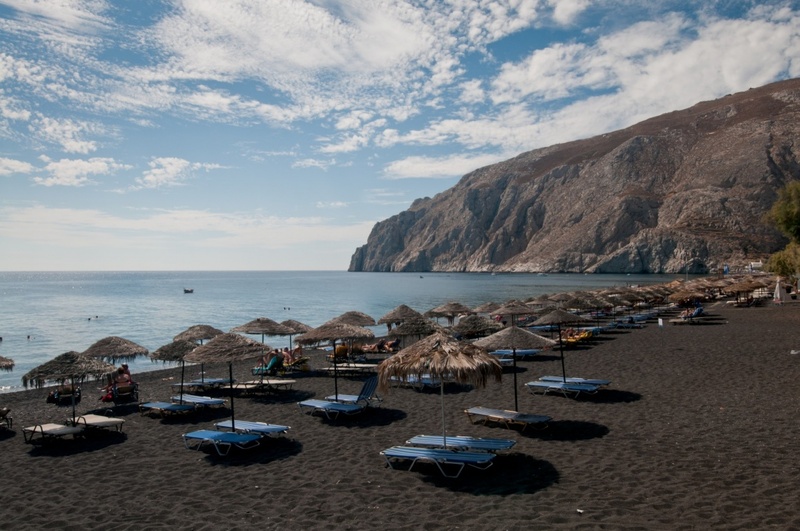 Kamari is the basic beach in the east part of the island with its black sand, variety of restaurants, bars, etc. Monolithos is not that busy but is also offering you shallow waters and is ideal for families! Pori, Vourvoulos beach, Couloumbo are also some interesting options that you have. Whichever part of the island that you choose be aware that you will fall in love with the most romantic greek island!